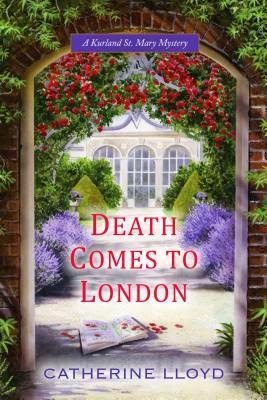 I’m using my holiday break to do some marathon reading and decided to dive right in to book two of the Kurland St. Mary Mystery Series: Death Comes to London by Catherine Lloyd. I was particularly eager to read this book after having so enjoyed Death Comes to the Village. I wanted to see what would come next for the hero and heroine. And now I’m hooked and a bit unhappy that there isn’t a book three yet for me to grab. Miss Lucy Harrington is finally getting her wish to go to London. Although a bit old for a London Season of her own, she will be accompanying her younger, more beautiful sister Anna, as well as her friend Sophia–a Waterloo widow. All three will be looking for husbands, but only Anna will be newly launched. Fortunately for Anna, she will be able to rely on an aunt and uncle (an earl and countess) to present her to society. Lucy intends to keep to the background as a companion, but nevertheless hopes to enjoy her stay and meet someone. What she does not expect is that Major Robert Kurland will upset her plans. Robert has no intention of following her to London. He thinks her idea of searching for a husband is quite ridiculous. However, she is scarcely gone when he receives a summons from the Prince Regent. It seems his heroism at Waterloo has not gone unnoticed. He is to be honored with a baronetcy. There is no way to decline such an honor. And, he recognizes that he is going to have to resign his commission because, although he has been slowly healing from his injury, he will never again be suited for battle. So, a trip to London is in order. Their paths cross, of course. Almost immediately, Robert is monopolizing Lucy’s time, almost inadvertently. And then, before too long, a shocking death occurs in their social circle. When it begins to seem that the death may be murder, they find themselves joining forces once more to solve a crime. Or two. Or three. The mystery is interesting and, once again, Lucy and Robert make an appealing duo. The relationship veers between friendship and budding romance. As a series, it makes sense not to develop any romance too quickly, so it’s fortunate that their working relationship is so strong. Again, there is a pleasant supporting cast and a variety of suspects so that even though you’ll probably figure out whodunnit fairly easily, it’s still an entertaining read to go along with them as they piece together the clues. This is a highly enjoyable cozy mystery. While this story could likely stand on its own, I recommend reading book one first to get the full flavor of the relationship of these two sleuths. 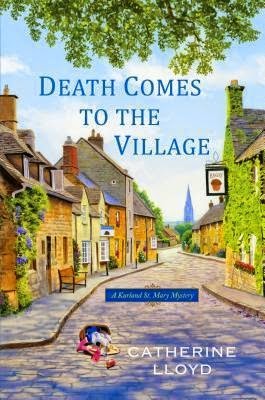 Death Comes to the Village by Catherine Lloyd is a cozy historical mystery with a hint of romance thrown in that was just the thing for a relaxing Thanksgiving morning read. Major Robert Kurland is the town magistrate, lord of the manor of Kurland St. Mary, returned to town a war hero after the Battle of Waterloo. Unfortunately, he was badly injured. His leg was shattered after his horse fell on him, and it is slow in healing. He has been confined to bed for months. This has left him ill-tempered and starting to despair. But one sleepless night, gazing out his window, he spies a man furtively carrying something across the edge of his property and that ignites his curiosity. Lucy is a no-nonsense sort of girl. At twenty-five, she has not given up hope of one day breaking free of her father’s grasp, marrying, and setting up a household of her own, but she does recognize that her chances are fading fast. She has a good deal to put up with, so she doesn’t allow Robert to wallow in self-pity, and he appreciates that. He asks her to let him know if there have been any reports of disturbances in the town, confiding what he saw. Lucy is glad to help, especially since she has a mystery of her own to solve. One of her housemaids and a girl from town have gone missing. She soon learns that there has also been a rash of petty thefts throughout the town. Together, Lucy and Robert join forces to put the clues together, with Lucy doing the legwork, while still managing life at the rectory. Robert, meanwhile, is going about the business of recovering as well as trying to take up the responsibilities of magistrate–things he has let slide for too long. But as they start to get close to finding their answers, things get dangerous. Are a rector’s daughter and an immobile man any match for a cold-blooded murderer? This quick-paced novel, somewhat reminiscent of Hitchcock’s Rear Window, brought together two charming protagonists with a sweet supportive cast. The father was rather awful, but that helped to make Lucy shine even brighter. Robert and Lucy make a wonderful detective pair. 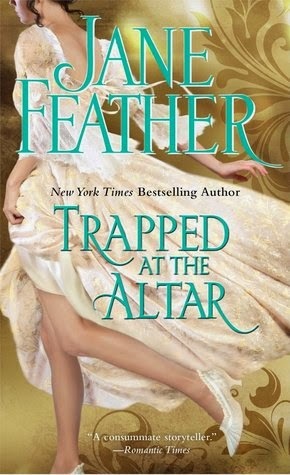 I have book two on my e-reader and hope to get to it soon! If your a historical fiction fan, check out the large online database of reviews at the Historical Novel Society's website. Headstrong Ariadne Daunt is convinced she loves handsome Gabriel Fawcett, but her grandfather has other plans for her. He decrees that she marry Ivor Chalfont, thus forging a powerful alliance between the two warring families who share ownership of their valley. Given no time to plot an escape, Ari finds herself standing reluctantly at the altar, swearing to honor and obey a man who is not her choice. Ivor has treasured Ari as a friend ever since he was brought to the valley as a child, but now he feels a man's desires. He longs to take the beautiful young woman to his bed and make their marriage more than an empty vow. Ari may believe she loves another man, but Ivor believes otherwise—and he will not rest until he gains her heart, her trust . . . and her passion. My review is here at the HNS website. This is my 22nd book read for the historical fiction challenge hosted by Historical Tapestry. I'm closing in on completing the challenge! It's been a long time since I've taken part in the book blogger hop. Fridays are really busy for me, and then it's hard to jump in if I've missed the start. But I decided to do it this week. The hop is hosted by Ramblings of a Coffee Addicted Writer. Wander on over to find out how to participate, to find the other blogs that are hopping during the week, and to link up your own blog. Explore a lot of other blogs. Make comments when you think of it. (Everyone loves comments.) Take part in memes that strike you. Book blogging is most fun when you feel like you're part of a book loving community, so get out there and join that community. For my classic mystery/suspense novel for the Back-to-the-Classics Challenge, I wanted to read something from The Adventures of Sherlock Holmes by Sir Arthur Conan Doyle. There are so many different collections out there, it’s hard to know where to start, but I had a little help from my son, who is a huge fan of the TV series Sherlock. I haven’t seen the series, but started watching the show with him from the beginning on Netflix, and read a collection of stories to correlate roughly with some of the shows. So, the book I’m reviewing contains A Study in Scarlet and The Hound of the Baskervilles. I also read A Scandal in Bohemia from a separate collection. A Study in Scarlet is a good place to start, since, as the first story in the canon, it introduces Dr. Watson and Sherlock Holmes. It’s quite different from what I expected. I thought it would be a much more straightforward detective novel- a murder, the detective following a trail of clues, and the eventual solving of the mystery. Sherlock would display his incredible insightfulness. But it isn’t much like that at all. There is the introduction of the characters. A murder occurs. Then the reader is cast back in time, onto another continent, to be introduced to the young murder victims and the murderer. A great deal of time is spent on their backstories. By the time we return to Sherlock and Watson, it’s pretty clear who the killer is. The mystery is how does Sherlock figure this all out. And that’s wrapped up with a bit of explanation. The Hound of the Baskervilles similarly took me by surprise. It is Watson who dominates the story and does most of the detective work. Sherlock again comes in at the end. He adds a few pieces of important information, but his detective work seems fairly minimal compared to Watson’s labor intensive and more exciting activities. The stories are interesting and quite fun to read, but as murder mysteries go, I was rather underwhelmed. They are more interesting for the people and as period pieces. I hate to admit it, but I enjoyed the TV series more. The afterword of the book discussed Sherlock Holmes as a breakout character–how he is a literary creation that has "broken out" of the books. Everyone knows who Sherlock Holmes is, whether they have read the books or not. People know what it means to be "a Sherlock Holmes." I think that’s still true. Especially now with the popularity of the TV show. But then, I wonder. How true is it? I was at a book fair two weekends ago, and talked briefly with a young teenage boy. My guess is that he was in the 12-14-year-old range. Trying to place the timeframe of a historical novel, I referred to "Richard the Lionheart. . .the Crusades"–which drew a blank stare. I said: "Robin Hood." And he shook his head. I was dumbfounded. How is it that Robin Hood has fallen out of general cultural literacy? Is it the lack of Bugs Bunny on Saturday mornings? Does it matter? Was I sad for no reason? I wonder if in another 10 years, kids who hear a reference to Sherlock Holmes will not get it. Two more books and I’ll be done with my Classics Challenge, but less than 2 months to go. I’m not sure I’ll make it. Where did the year go? I might not get to all the classics I hoped to read for the 2014 Back-to-the-Classics Challenge, but I’ve just completed the last of the books in the required category, so that’s a partial victory. And since it’s a historical novel that’s been sitting on my bookshelf for a couple years, I’m going to triple dip and use it for all three challenges. It is old-fashioned pioneer literature, following the trail of Diony Hall (Jarvis). Diony begins as a 15-year-old hardworking daughter of a "plantation" owner, Thomas Hall, in Albemarle County, Virginia, in 1774. The description of the family farm sounds rather small by the standards of what I think of for a plantation, but Diony and her family are comfortable and settled–though life is not one of ease. Diony is the oldest daughter. She’s pretty and intelligent and seems to be her father’s pet. The book is a bit of a slow-starter, but it is rich in the details of daily life and immerses us in the dreaminess of Diony’s thoughts. She’s a restless sort. Diony and her neighbors are hearing a great deal of talk about Kentucky, a paradise beyond the hills, which sets her to thinking about life’s possibilities. And as Diony grows into young womanhood, she becomes aware of a neighbor, a young man, Berk Jarvis, who has the same restless spirit. He sets off to get a better look at Kentucky. When he decides he’s going to move on, he asks her to come along. They marry and set off, along with other Jarvises, including Berk’s mother Elvira, for Fort Harrod. They travel with a small party of other pioneers along Boone’s Road. The journey is narrated through Diony’s eyes in a descriptive detail that is interesting and realistic. She focuses on things that are important to her and skims over other incidents, so that moments of high drama are lacking, but the realism make it more compelling. The story becomes more dramatic, more exciting, as they settle into life in the fort. There is a more or less constant threat of Indian attack–a threat that is eventually realized. Diony has to cope with a great deal as a pioneer woman. This writing is in an older style. There’s very little dialogue, and a lot of internal monologue. The romance is quite understated. In fact, the necessities of life require Diony and Berk to be apart much of the time. And yet, there is something extraordinarily solid about their love that makes the great love of many more modern romances seem shallow. As a transplant to Kentucky, I’ve picked up a little of the state’s history here and there, I’ve been to visit Fort Harrod, but my knowledge is pretty limited. This novel does a wonderful job of bringing to life that early settlement phase of Kentucky’s history. 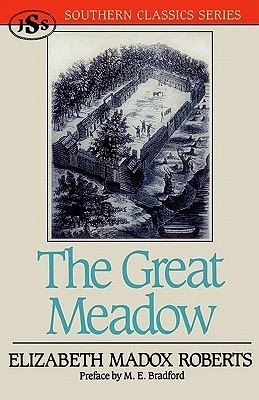 If you’re looking for a classic that’s a little bit different, I highly recommend The Great Meadow. Our historical fiction/history book group has been on a bit of a hiatus. We’ve been having trouble finding a time when we all could meet. 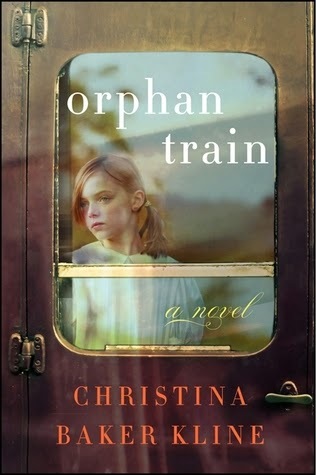 But we’re finally getting together this weekend to discuss Orphan Train by Christina Baker Kline. This book is set both in current day Maine and in the late 1800's-early 1900's in the Midwest, telling the story of two orphans in the foster care systems of their times. Molly is a 17-year-old modern day troubled teenager who is about to be kicked out of yet another foster care home. This one she had settled into fairly well, but made the mistake of trying to steal a library book. Her one last chance is to perform community service, cleaning out the attic of an elderly woman, Vivian Daly. Vivian, as it turns out, is a survivor of a different type of foster care experiment–the orphan trains. Orphans were scooped up from the dense, crime-ridden Eastern cities, put onto trains, and transported to the Midwest where they were offered up for adoption to farmers or townspeople. While babies or toddlers might find loving homes, the older children and teens were often times treated as free labor. Vivian, a red-headed nine-year-old, faced hardship, rejection, abuse, and uncertainty. As Molly and Vivian’s stories unfold together, a friendship develops, beneficial to them both. This is a lovely story. It brings to light a fascinating part of the nation’s history that hasn’t received a lot of attention, and highlights some of the ongoing difficulties with foster care. While there aren’t a lot of surprises in the narrative, it’s an interesting read. The book, originally issued as a paperback, has been re-released in hardcover–so it’s doing very well–and for good reason. I expect we’ll have a wonderful discussion at book group! I am a tremendous fan of Michael J. Sullivan’s writing. I devoured the Riyria Revelations trilogy and then read the first prequel, The Crown Tower, because I just couldn’t get enough of his fantasy world. The final book available so far is sitting on my shelf. I haven’t read it yet because, once I do, there won’t be any more, so I’ve been holding off. Which brings me to Hollow World. Sullivan has written a science fiction thriller (I guess that is the right genre) and although this is even more out of my normal sphere, I decided to give it a whirl. Ellis Rogers is our hero, a mild mannered engineer with nothing to live for (a failed marriage, childless since the death of his son, and one friend with whom he shares a history but has little in common–the guy is a doofus and a slob) who discovers he has a terminal illness. This news elates him because he is now free to experiment with the time machine he has built in his garage. The time machine will only go forward, which is fine with Ellis who wants to see what will happen to the world. He sets it for 200 years in the future, and off he goes. Unfortunately, his calculations are off by a decimal point. The world he lands in is nothing like what he left. Sullivan displays his usual skill at world building. The global climatic catastrophe has occurred, so the human race has moved underground, or into Hollow World. The political system has changed. And so has the human race. 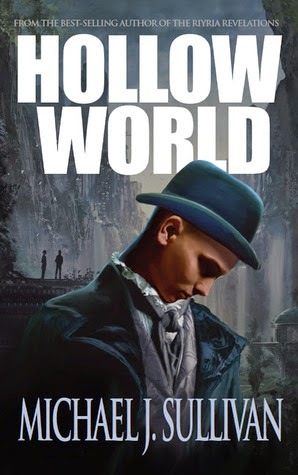 It can be debated (and is debated) whether this new world is a utopia or a dystopia, but before Ellis can sort out how he feels about where he must live out the rest of his days, he has a murder and a conspiracy to solve. These things are unheard of in the far distant future, so his new friends need someone with experience to help, and a twenty-first century engineer is the closest thing they’ve got. This is a thought-provoking novel and an interesting read with straightforward characterizations and a fast-moving plot. Still, it didn’t really absorb me the way The Riyria Revelations did. It could be that time travel and science fiction are just not my thing, no matter who is the author. I will say I’m glad I read the fantasy first. If I’d started with this, I don’t think I would have been so impressed that I would have raced out and bought the fantasy trilogy.